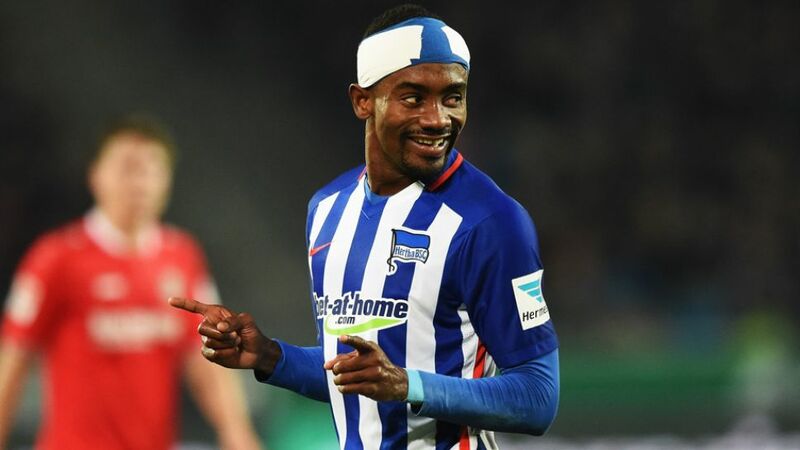 Salomon Kalou starred with a hat-trick as Hertha Berlin rose to fourth with a 3-1 win at Hannover 96. Hannover's recent form had shown an upwards trend, but Hertha appeared keen to sniff that in the bud as they got in the first three shots of the game without the hosts mustering one. It stood to reason, therefore, that it was the guests who took the lead in the 33rd minute when Genki Haraguchi squared the ball for Kalou, whose shot went through the legs of Miiko Albornoz and slid under the unsighted Ron-Robert Zieler. Only at the end of the opening 45 minutes did the hosts finally start to show a sign of life, but the half-time whistle interrupted any momentum they could create. They tried to carry on where they had left off at the start of the second half, with Michael Frontzeck having tinkered tactically with his side, sending Allan Saint-Maximin on for Felix Klaus. The signs were good, but Hertha delivered the sucker-punch on the counterattack with Vladimir Darida launching the ball long for Kalou, who kept his composure to beat Zieler again. Hannover got a lifeline ten minutes later when a penalty was awarded for a foul by Marvin Plattenhardt on Uffe Bech. Hiroshi Kiyotake slotted the ball in, but Hertha stood their ground and wrapped up victory with Kalou completing his hat-trick from the penalty spot late on. Were it not for Salomon Kalou, Hertha Berlin might well be in the midst of a relegation battle rather than challenging in the upper echelons of the Bundesliga. He has already scored goals worth three points twice this season, and his hat-trick dismantled Hannover to earn the Old Lady the points again, with his ability to pick up on and take half chances with such aplomb giving Hertha Berlin a seriously sharp weapon. Hertha Berlin may have been one of a group of clubs setting their sights on 40 points at the start of the season – a fictional figure usually good enough to avoid relegation. With only 12 games of the season gone, they are already halfway to that mark and possibly in a position to redefine their objectives for the season. Were the season to end now, for example, they would be in a play-off for a place in the UEFA Champions League. Kalou netted his first Bundesliga hat-trick against Hannover.The Cote d'Ivoire international has now already bettered his haul from the whole of last season (six goals in 27 games).Kiyotake netted his second penalty for Hannover. His only miss from the spot came for 1. FC Nürnberg.Kalou scored Hertha's first hat-trick since Theofanis Gekas on 21 March 2010 in a 5-1 win in Wolfsburg.